Outside Southeast Asia, few people know of Palembang, a city on Sumatra, the sixth largest island in the world. A gloomy and immense city, with almost two million inhabitants, most of them living in cramped and squalid conditions. The tropical River Musi bisects the city, a desperately polluted waterway, bordered by slums built on stilts and a few old colonial buildings. Vessels of all types use the Musi, hauling everything that can be sold abroad or to the rest of Indonesia. The river is jammed with enormous barges filled with coal, oil tankers, makeshift boats carrying palm oil fruit bunches, as well as countless ships carrying timber. Plunder is done openly; there is no attempt to conceal it. Ms. Isna Wijayani, a Professor at Bina Darma University in Palembang, laments on the situation. Bina Darma University invited me to speak on the manipulation of the Indonesian media by the West. I was asked to address some 100 selected students and lecturers from the region. What followed was an hour-long discussion, during which I clearly understood how little is known, even among the local students and teachers, about the dire environmental situation in their part of the world. “We have no idea about the extent of deforestation around here,” explained Ms. Lina, a student. Just as I had done several years ago, I rented a makeshift speedboat and instructed the captain to take me around the delta to Upang, a village more than one hour of literally ‘flying’ over the murky waters from Palembang. For the first few kilometers, hellish-looking factories lined up along both shores. All of the plants appeared to be forming a grand coalition, serving a single goal: to destroy what remains of the once-pristine tropical paradise. There was the Pusri plant, producer of fertilizers, one of the largest in Southeast Asia, belching smoke and spewing an unbearable stench into the air. Right across the water, surrounded by slums, a wood-processing plant was emitting yet another very distinct odor. Local children were swimming nearby, clearly oblivious to health hazards. At Kapitan village, several women were washing their clothes in the filthy river water, and then brushing their teeth in it. As the woman spoke, a grotesquely swollen carcass of a dog passed slowly by in the water just a few meters away. Deforestation was essential for the construction of all local industries. But how ruthless is deforestation in Indonesia? How bad is its contribution to global climate change? The simple answer is: it is not just bad; it is dreadful. Since 2007, not much has changed. The country has already lost well over 70 percent of its intact ancient forests, and commercial logging, forest fires and new clearances for palm oil plantations threaten half of what is left. The greed seems to know no boundaries. The result: Sumatra and Kalimantan islands are now choking on their own pollution, although the agony spreads far into neighboring Malaysia and Singapore. Year after year, millions of people get affected, classes are cancelled, airplanes grounded, and regular activities averted. Hundreds of thousands of people are suffering from acute respiratory infections. Hundreds lose their lives. Some even call the unbridled ‘export of pollution’ a ‘crime against humanity.’ Emotions are running high, and many citizens of Malaysia and Singapore protest by boycotting Indonesian products. On several occasions, I witnessed thick smog covering the skyscrapers of the leading Malaysian cities, and of Singapore. In 2015, during the ‘big fires’ of Sumatra, life in Kuala Lumpur almost came to a standstill. This time, landing in Palembang, the haze had been covering almost the entire runway. “Visibility six kilometers,” the captain of Indonesian flagship carrier, Garuda, informed us, not long before the touchdown. In fact, the visibility appeared to be no more than 200 meters. But in Indonesia, many ‘uncomfortable facts’ are denied outright. Throughout the following days, my eyes became watery and my joints were aching. I kept coughing uncontrollably. When I was asked by the Italian ‘5 Star Movement’ to record my political message (I did it in a local slum), I could hardly speak. The trouble didn’t just come from the forest fires: everything here seemed to be polluting the environment: the burning of garbage, traffic jams, emissions from unregulated factories, even cigarette smoking in almost all public places. 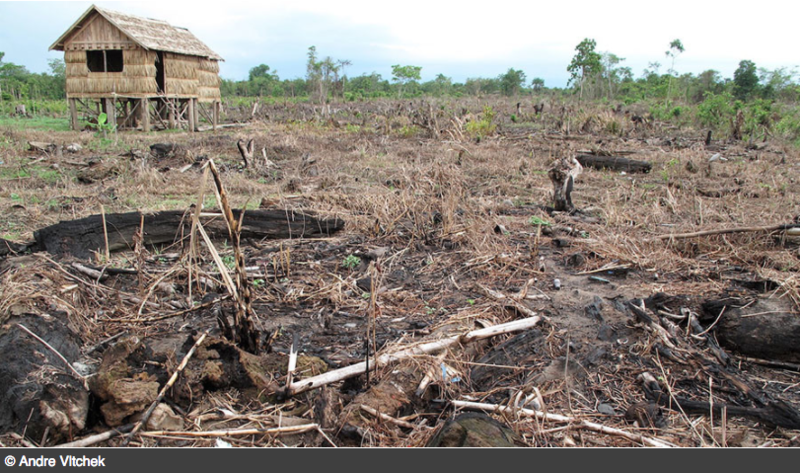 Along the Musi River, the original forests are gone, replaced by rice fields, palm oil, and rubber plantations. I spoke to dozens of farmers and fishermen. Most of them have never heard about global warming, others didn’t care. In Indonesia, the struggle for bare survival is what propels most of the people – this, as well as the cynical chase for profit, pursued by the ‘elites’. I described it in detail in my damning book ‘Indonesia: Archipelago of Fear’. At some point, the captain of my boat became hostile. Angry, frustrated and nationalistic, he began sabotaging my work, constantly rocking his boat in order to prevent me from photographing disaster areas. Still, I prevailed. I had to. Millions of people were suffering; dozens of species were disappearing, including tigers and rhinos, elephants and orangutans. Mr. Ahmad doesn’t understand that it is the destruction of tropical forests that has a direct impact on the rising levels of his river. Local university students, who are accompanying me, know what’s happening, but they don’t seem to care. As I interview farmers and fishermen, they’re chatting on their phones, clearly indifferent. “The environmental destruction around Musi River, particularly of the rainforest, is very bad, and it continues. The great fire of 2015 showed how bad the management of the rainforests is in Indonesia, particularly in Sumatra,” Ms. Khalisah Khalid working for WALHI (the Indonesian Forum for the Environment), told me over the phone. However, for many different reasons, environmental disasters do not seem to be treated as emergencies: by the government, mainstream media, even by local people. For years, I worked in many parts of this enormous and once stunning island, from Aceh to Lampung. I also worked all over Oceania (‘Oceania’ is the title of my book covering that vast part of the world), the most affected area of the planet, where entire countries are now disappearing due to the climate change. Global warming has an undeniably devastating impact on the whole world, including the Palembang area itself. In the short term, palm oil and rubber plantations may bring some profits to the companies, even to local people, but tens, maybe hundreds of millions of lives could be disrupted, even broken as a result. The price is too steep, but in Indonesia, there is hardly any discussion on the subject. Too many powerful individuals are involved, and too much money is being made. Now those who claim that there is no climate change have a powerful ally in the White House. And so the silence reigns. The water is rising. Increasingly, smog is covering, like an endless and deadly duvet, this entire part of the world.